Lyndsey Fifield: How to wait. I don't know how most of you guys blog, but I've written and saved about 398420958 drafts that may never see the light of day. Sometimes I go through them and smile at old thoughts I had that I must have thought better than publishing at the time—often very wisely so. Yesterday I came across a draft that I wrote about 6 months after I got into my car accident when I decided to commit to the lifestyle change of being carless. I did the math in my head and realized it's been over two years now and I'm still just as happy to live my life without the burden of a car. Getting into a car accident was possibly the best thing that ever happened to me. I never thought I would be able to endure, let alone enjoy, not having a car—but I absolutely do. 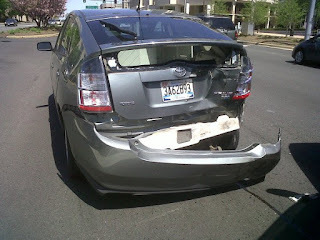 After my accident, when I was making the decision on whether or not to buy a new car to replace my Prius, I read a post Leo Babauta wrote for Zen Habits about what he and his family learned from taking public transportation. It summed up my attitude almost perfectly—the biggest difference being that it's just me and I don't have to include herding small children in my commuting plans. I will be honest: entering children into the equation would probably make me a little less zen. There is something romantic and human and alive about walking down a city street instead of driving down one in a car. You see the sleeping cats on porches and overgrowth of weeds around aging patio furniture. You see other people emerging for their commutes. You see flowers (right now: peonies) and when you see a meter attendant you never have to worry—it's never, ever going to be your car they're ticketing. Say hello to passersby. Realize that yes, you're becoming your mother. I know the name of the crossing guard (Monica) at the school beside my house and say good morning to her every day as I walk to work. When I need a car (Target, IKEA, road trip) one always materializes somehow—especially when I offer to fill up the tank. Not having a car has forced me to truly prioritize what I want to do with my time. If I truly want to spend time with someone who lives across town, I have to make a little plan in my head (Metro or bike? Bike home after dark? Metro home alone? Cab home?) and make my choice accordingly. I also have to make wiser choices about what I actually need. I walk to the farmer's market and Yes Organic on Saturdays and get only as much as I can carry home. I remember the way I used to act as a driver and car owner. I was constantly feeding money into a pit for insurance, payments, registration, parking tickets, gas, and maintenance. I had occasional road rage and I let traffic and rude drivers rob me of my joy. I also carelessly texted while driving—which is just stupid. I don't like the part of myself that gets instantly impatient and frustrated. When I walk, I'm constantly in motion and I never feel trapped. If I feel like I might be late to something I walk faster or I start running. If I have to wait at a crosswalk for a long time I just take a deep breath and check my email. Joy levels: through the roof. So let's change the pace a bit: When my bike was stolen everything changed. I used to ride happily around the city—for free, feeling my legs getting stronger and faster as the months passed. When it was stolen, instead of buying a new one or using bike share, I just started taking metro and walking more. I shopped for new bikes but nothing was ever exactly what I wanted—and I was terrified of investing in something that could be gone again in the blink of an eye. Despite the fact that two of my friends recently had their bikes stolen on the hill (tis the season) I think I'm ready. I want a new bike. I want to ride it around DC and on bike trails in NOVA, I want to go fast, I want to be able to easily carry it up my front stairs every night, put my gym bag (read: huge) on the front or back, and spend less than $900. So bike experts, tweet me your suggestions @LyndseyFifield - or just tell me about your experience and choice to go carless in the city!